Few marques enjoy the perception of exclusively and class the way Aston Martin does. Though they’re seeking to broaden their horizons a bit these days, there’s no denying that the brand carries some well-founded clout. 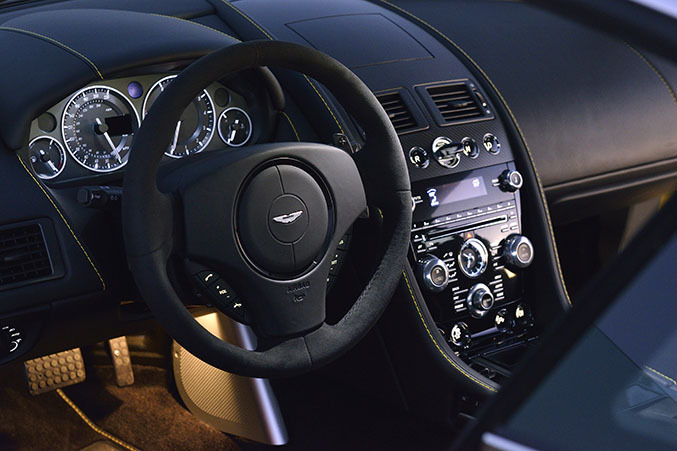 While most enthusiasts would consider Aston’s cars to reside closer to the grand touring side of the supercar equation than an equivalent offering from, say, Porsche or Ferrari, after having spent some time behind the wheel of the V12 Vantage S, we can report with no uncertainty that this particular model is no soft-edged cream puff, and brings enough performance prowess to the table to set just about anyone’s hair on fire. Of course, that doesn’t come without a bit of compromise as well. 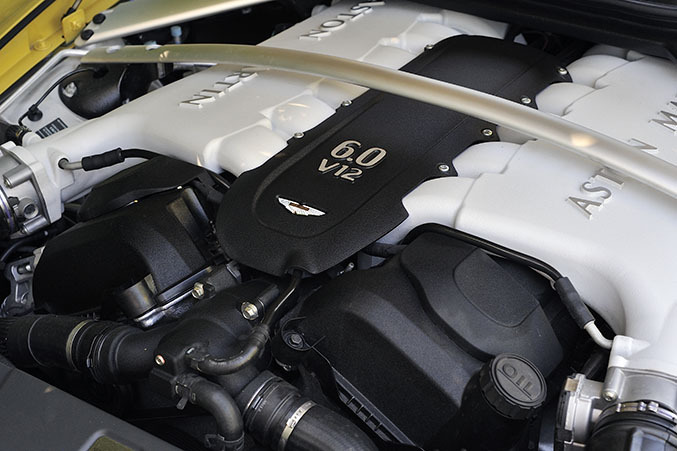 What’s the idea behind the V12 Vantage S? 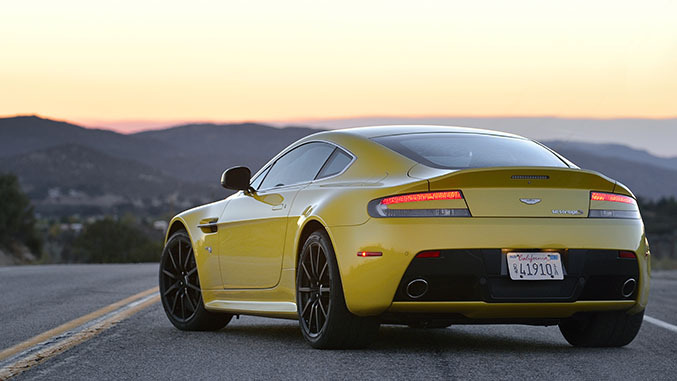 In the simplest terms, the V12 Vantage S is the hot rod among Aston’s lineup. It takes the smallest and lightest chassis in AM’s lineup and pairs it with their largest production motor, the 6.0-liter V12. Aside from the limited run One-77 hypercar, which is no longer in production and commands a seven figure sum for ownership, the V12 Vantage S now stands are the fastest road-going Aston Martin money can buy. The AM28 6.0-liter V12 produces 565 horsepower and 458 pound-feet of torque, and sounds absolutely sonorous while doing so. Sending that power to the rear wheels is the SportShift III transmission, Aston’s paddle-shifted automated manual gearbox. The pair give the Vantage true supercar urgency, getting to 60 mph from a standstill and 3.6 seconds on its way to a top speed of 205 miles per hour. Set to its sharpest drive settings with manual paddle shifting, the V12 Vantage progresses with absolutely authority and unyielding pull. While most in the industry continue to follow the trend of smaller displacement bolstered by forced induction, the presence of a big, naturally aspirated motor here is a welcome rarity. Power delivery never loses steam or waivers from linearity as the tachometer makes its rapid approach toward the 7200-rpm redline. The racing pedigree of this drivetrain is obvious, and used in similar context, it is a joy to experience. It is a supercar, after all. But with that comes some tradeoffs, as living with the V12 Vantage S in the real world does require some patience and acceptance of the fact that uncompromised performance often translates into compromises elsewhere. Before setting off, an Aston Martin engineer took a moment to discuss the gearbox with us. It’s a single-clutch, seven speed automated manual that’s supplied by Graziano Oerlikon, a company that specializes in high performance and race transmission applications. It’s 55 pounds lighter than the six speed manual it replaces, we’re told. But we're also warned that it takes some getting used to, and that in general use, it's best to leave it in manual mode until we hit the freeway. Once we set off, it becomes clear why some coaching might be advisable – this automated manual, left in automated mode, leaves something to be desired. Imagine if you will for a moment that you are driving a traditional manual transmission car. Now, imagine that instead of operating the shifter and clutch yourself, a robot has been tasked with this operation – that is, the operation of engaging the clutch, shifting the gear, and disengaging the clutch. That is the most literal way of explaining the somewhat odd sensation you’ll experience driving the V12 Vantage S in automatic mode. It doesn’t feel like an automatic – it feels like a manual gearbox being operated by someone else, replete with the sudden drop in forward momentum at the moment of clutch engagement. It stands in such contrast to how well the gearbox works when paddle shifted that we would agree with the engineer who suggested we reserve automatic mode for the highway – coincidentally, a place where not a lot of shifting happens – because the relatively lethargic, yet somehow also ham-fisted delivery of each automatic gear change is enough to detract from the overall enjoyment of the car. But as long as you’re willing to use the paddles – the mode in which this transmission was clearly designed to spend the majority of its time – the seven-speed happily works in the concert with the rest of the mechanicals. 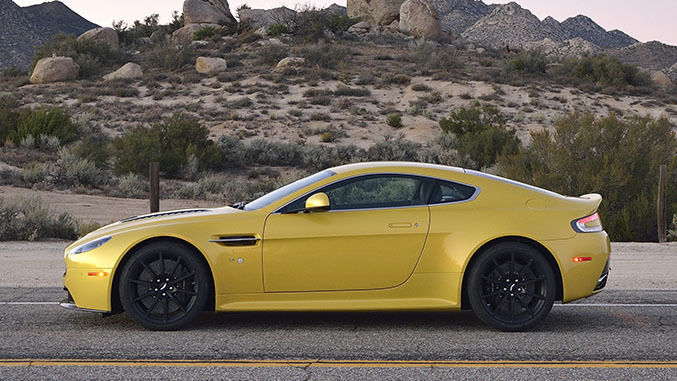 How does the V12 Vantage S handle? Despite its roster of high performance components, engineers were wise not to forget that this is, after all, an Aston Martin. With its three-stage adaptive dampers, the 12 Vantage S suspension can be supple one moment and unyielding the next simply by choosing between drive modes (Normal, Sport and Track), which also adjusts the amount of power steering assistance offered by the ZF-Servotronic hydraulic system. Inside our tester felt appropriately posh, and finding an agreeable seating position required minimal effort for your author and his six-foot, three-inch frame. These buckets provide a well-sorted middle ground - comfortable for extented stints on the highway, but also bolstered well enough to keep you from being thrown around the cabin during hard lateral maneuvering. While the Vanquish Volante we tested last year benefits from a new instrument panel, the Vantage continues with a carry-over design. This, along with other design elements – notably the steering wheel and switchgear – are starting to show their aesthetic age in 2015. Aside from the positioning of the emergency brake, which invites you to smash your hand against the driver’s door arm rest when releasing the brake, the controls are intuitive to use and generally pleasing to operate. The V12 Vantage S sports a base price of $184,995, and optioned like our test car was, the price will shoot north of $200K. Both ends keep the V12 Vantage S within spitting distance of cars like the Audi R8 V10 Plus we drove last summer, and both provide similar levels of performance. The V12 Vantage S is probably the more visceral experience of the two - it's more emotive and in some ways, more engaging. It’s also worth mentioning that in this realm of vehicles pedigree goes a long way, and Aston Martin has Audi beat in that regard as well. Emotion plays a big role in choosing one's supercar - this is not a buying decision steeped in pragmatism. The shape, the sound, the way the car makes you feel when driving it - the intangible elements often become the most compelling aspects of a supercar. And the V12 Vantage S is a supercar by any definition, both good and bad. While it may not be perfect for everyone, we have little doubt that it is perfect enough for some.